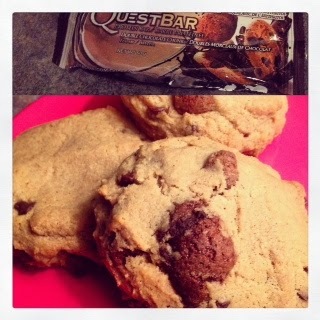 Quest bars are the newest protein bar craze - and I'm definitely all over that. These bars are great because they come in a variety of flavours, they are gluten and sugar free, and they are loaded with protein. But my favourite part about them is that they can act as a great baking add in! These cookies are a cleaned up version of a chocolate chip cookie. They are great for those late night sweet cravings or mid afternoon snacks. 1. Preheat oven to 325 degrees. Line a baking tray with parchment paper. 3. In a large bowl mix together both nut butters, vanilla, and egg whites. Once smooth add protein powder, baking soda, and salt and mix together. Once smooth add Quest bar pieces and chocolate chips and stir until combined. 4. Drop dough by spoonfuls onto prepared tray and press down with your fingers or a fork so they are flattened. You should get 20 cookies. 5. Bake for 8-10 minutes or until ever so slightly browned. Let cookies cool and harden before eating.